This week I will continue the “how-to” mini-series of articles related to our products, by presenting you the “redirect” feature of Auto Reply Manager (it’s actually a special type of “send on behalf“, but we’ll get to that in a moment). Since we’ve reached an honorable version number with most of them (v5 for Email Address Collector or v4 for Bells&Whistles for example), I’m pretty sure that most of you aren’t aware of some of the features our products have to offer. Since most of the people coming to our website are only looking for a particular feature (and they will use Bells&Whistles only for the “Insert Reply-To address” for example) without taking into account all the other great options, here’s one of the lesser-known features of our autoresponder add-in for Outlook, Auto Reply Manager: redirecting emails with “send on behalf”. The send-on-behalf email is usually generated when one uses a Microsoft Exchange server and has granted these special rights to another user; for example, a manager’s assistant would send emails on behalf of his/her boss (in this case, the assistant would be a Delegate). In addition to sending on behalf of the manager, the assistant can be given ever further rights, such as Sending As (where the recipient can’t tell who actually composed and sent the email, as opposed to our case – where it is clearly stated in the From field that the email came from “Assistant”, who sent on behalf of “Manager”). Microsoft’s Exchange server allows for many more customization options and is a really good and flexible tool for larger companies, but since it’s a rather costly solution (since you’ll probably need a network admin as well, to deal with the myriad of options), we’ll look on how you can redirect and send on behalf from Auto Reply Manager. Even if this goes without saying, first you will have to download Auto Reply Manager from here and then install it on all computers that will use the send on behalf redirect feature (this, for example, isn’t necessary for MS Exchange, but the good news is that you can install and use ARM on two computers with the same license!). 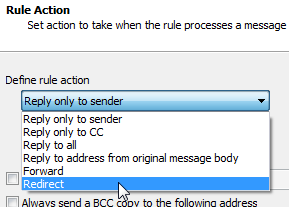 Then, on the computer on which the emails that need redirecting are received click on the Edit Rules button in the Outlook interface and choose to Add a new rule – ours will be named “Send on behalf”, for example. Afterwards, you can configure which account ARM will be active for, which folder, the incoming message’s filters (so that ARM will or will not apply the rule) and many more. When you reach the Rule Action screen click the drop-down list and select to create a “Redirect” rule. Enter the desired address, which will receive the emails as sent on behalf of the account ARM now scans, and that’s it! Of course, you can add many more features, like a different account from which the message will be sent on behalf of the account it was received on, add tracking IDs and many more. So, everything went OK and my “Send on behalf” rule worked correctly. What use does this redirect/send on behalf, rule have? #4 send on behalf rule for the Water Pumps Sales Dept. : same as the one above, just instead of “issue” and “problem” they will have to change to “price, inquiry, cost” and so on. Here’s an example of this feature, which I am currently using: I have more than a few email accounts which I access both at home and at the office. On my phone, I have only a Gmail account that is always synchronizing, since I don’t like to be bothered by all the messages I receive on a daily basis. On the computer which has all of my email accounts defined, I created a redirect – send on behalf – rule based on specific keywords, so I’ll always be on top of those important messages immediately. Thus, I can quickly reply to the high priority stuff and fewer taps are always a good thing on a phone (with its still clunky copy/pasting and email editing). So, I hope you’ll try out the send on behalf/redirect feature of Auto Reply Manager, along with all the other great options it has to offer! Please feel free to post your questions or suggestions here, on our forum or send them to support@emailaddressmanager.com.